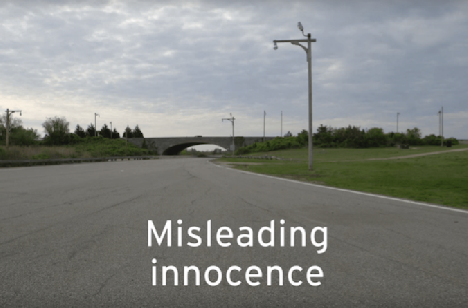 Misleading Innocence (tracing what a bridge can do) explores the story of the planning and politics of a series of overpasses on Long Island, commissioned in the 1920s and 1930s by Robert Moses. The story suggests that the overpasses were designed expressly to prevent the passage of buses, such that only carsand the people who could afford themcould access the leisure spaces of Long Island. This story, though rejected by historians of American urban planning, is often cited as a parable by scholars interested in control through architecture or technical objects, and more generally in the relationships of mutual influence between technology, politics and society. What is the relationship between politics and artefacts, between power and technology? How and to what degree can the intentions of a project be deliberately concealed? What are the deviously designed effects and the unplanned political consequences of the agency of the artefacts that surround us? On Screen is a new series of evening film screenings at Jacobs Hall, free and open to the public. This semester, On Screen and the Institute's other public programs engage questions of inclusion, accessibility, and justice under the title For Whom? By Whom? : Designs for Belonging. To learn more about upcoming events across our series, visit programs.jacobshall.org.